Cucumis melo chito is an annual plant, able to climb with the help of tendrils, but more commonly sprawling along the ground. The plant is sometimes cultivated for its edible fruit from the warm temperate zone to tropical areas. Melons also provide an edible oil and have various traditional medicinal applications. Probably native of Asia, though it has been in cultivation for so long its native habitat is obscure. Derived through cultivation, it is not known in a truly wild location though it sometimes escapes from cultivation and becomes naturalized in fields and waste places. 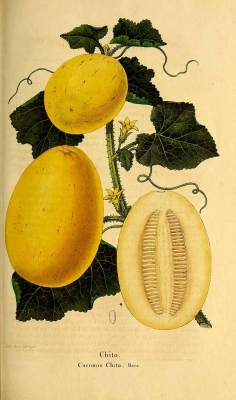 The orange melon occasionally escapes from cultivation and is naturalized in some tropical and sub-tropical areas.